For this fortnight Patter gave us the word "Delight" to work with. When I read the word a song based on this scripture came to my mind. It is many years since I sang this song in Church. I looked up this scripture in different Bibles and it is written slightly different in all versions. 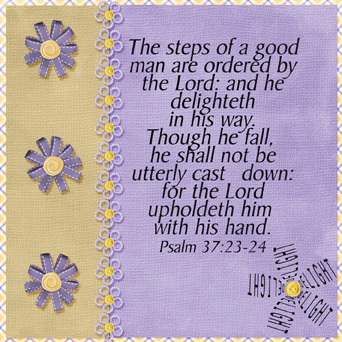 The "he delighteth" in the NASB has the he - with a capital "H"e which means it is the Lord that delights in the steps of a good man and I felt that is possibly how God intended us to read this scripture. He delights when we are walking correctly. He delights when we are living obediently to His word. So therefore it must disappoint Him when are not doing so.